For a long time now, consoles have claimed the center of the living room by virtue of the fact that you can connect them to 'the big TV', not worry too much about latency, and enjoy immersive visuals on a large scale (particularly now that 4K consoles have arrived). PCs may have greater power behind them, and be more capable of handling the highest-quality visual assets, but historically it's been hard finding a TV that can showcase PC games (4K and HDR or not) without resulting in latency issues; high quality and detailed visuals may be nice to look at in gaming, but smooth frame rates and minimal lag are more key to the overall gameplay experience. For that reason, fans of PC gaming have primarily had to rely on smaller monitors on desktops and laptops with the high refresh rates, low latency, PC-specific HDR, and G-SYNC variable refresh rate technology needed for the highest-quality gaming experience. Fantastic as these monitors often are for PC gaming, they’re not often the first choice for a center-of-the-home screen. Even with convenient devices such as Nvidia Shield, Steam Link and the Steam Machine, PCs haven’t quite managed to make the move from the home office or bedroom into other areas of the house as easily as consoles have. We can't help but wonder if that could all be about to change, however, with Nvidia’s new Big Format Gaming Displays initiative, recently announced at CES 2018. These 65-inch displays are being created in collaboration with Acer, Asus and HP for release in mid-2018. 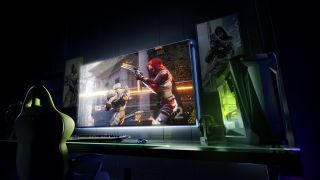 Nvidia is promising that the 4K 120Hz HDR capabilities with integrated Nvidia G-Sync technology and Nvidia Shield functionality will make them “the world’s first big-screen PC gaming displays, specifically designed for enthusiast gamers seeking the ultimate 4K PC gaming experience”. Making the most of a 4K display will require a high-spec PC with an exceptional graphics card that won’t come cheap, and though the prices for these displays haven’t been released yet we imagine they won’t exactly be budget affairs either. However, for the dedicated PC gamer looking to bring their favorite gaming platform into the center of their home, rather than relegating it to a desk in a corner, it could prove a worthwhile investment. Not only will they be able to have a central big screen display that can play their favorite games on their preferred platform, it’ll also allow them to access Netflix, YouTube, Amazon Video and other streaming services as well as control smart home features. For those who are tempted by the lures of PC gaming, but feel that a console slides more comfortably into their home setup, this is the kind of display that could change their mind, and provide them with the taster they need. With the Nvidia Shield built in, these displays will bring PC game streaming to a TV screen that will do the games justice without the need for any kind of additional setup or purchase. That’s not to say they'll push consoles out of the living room entirely, though – Nvidia is promising that the low-latency and reduced lag of these displays will also make console games feel more snappy and responsive. What we could see is greater balance between the playing of PC and console games in the home, because they can be enjoyed equally on the same display in the same part of the home. With big-screen displays PC gamers have the kind of TV that will allow them to use their PC as the multimedia powerhouse consoles claim to be. At this size, though, you lose the up-close-and-personal nature of the monitor. We definitely wouldn’t recommend sitting in front of one of these things with only the space of a desk between you. Hasn’t your mum warned you about your eyes going square?